With Jason Rezaian Jailed For 500 Days, His Brother Visits Iran's Mission At U.N. : The Two-Way Ali Rezaian brought to Iran's Mission at the United Nations a petition for his brother's release that has been signed by 500,000 people. With Jason Rezaian Jailed For 500 Days, His Brother Visits Iran's Mission At U.N.
Ali Rezaian, brother of Washington Post journalist Jason Rezaian — who has now been imprisoned in Iran for 500 days — brings a petition to the Iranian Mission to the United Nations calling for his brother's immediate release. 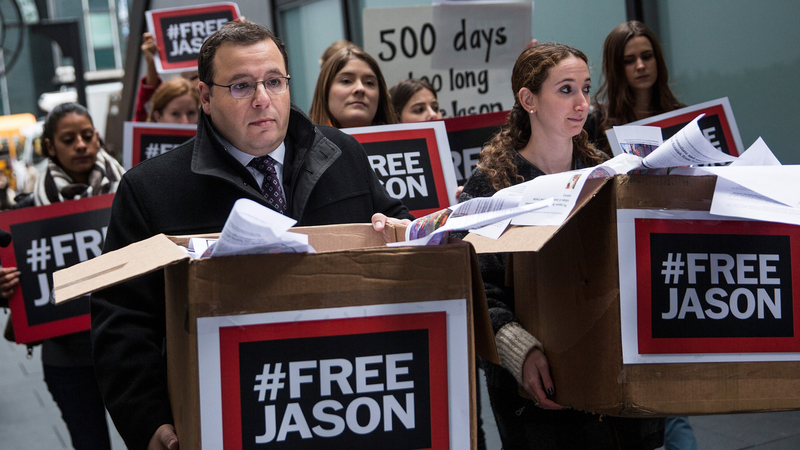 Marking the 500th day Washington Post journalist Jason Rezaian has been detained by Iran, his brother delivered a petition to Iran's U.N. Mission in New York, calling for his release. The U.S. also repeated its demand that Rezaian be released. When he was arrested and charged with spying, Rezaian was the Post's Tehran bureau chief. Thursday, Ali Rezaian brought a petition that had been signed by more than 500,000 people on the website Change.org. Describing his brother's current condition, Ali tells NPR's Steve Inskeep that Jason is being held largely in isolation, with one other person. "He's very depressed," Ali says. "He's angry; he just doesn't understand why this is all happening and gets very little information." He adds that his mother and sister-in-law have been able to see Jason during short visits, once or twice a week. When asked about U.S. efforts to free Rezaian, Ali says, "I haven't seen any consequences for the Iranians for holding Jason for 500 days illegally — by international standards, by their own laws. He's been held illegally, he should be released, and there haven't been any consequences for them." "As Rezaian's brother was delivering a petition to Iran's U.N. Mission, State Department spokesman Mark Toner was delivering a message at his daily briefing about what he calls an unjust detention. "Toner says the State Department raises this and other cases of detained Americans in each meeting with Iranian officials. Ali Rezaian, Jason's brother, says that hasn't been enough. And he's pressing this case with the U.N.'s working group on arbitrary detention." The 500-day mark was reached three months after the speaker of Iran's Parliament told NPR that a prisoner swap for Rezaian would be "one way" he could regain his freedom.